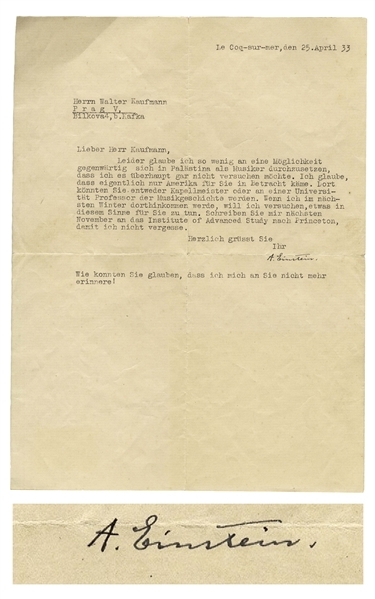 Albert Einstein typed letter signed from Le Coq-sur-mer in Belgium, where he lived for six months in 1933 after fleeing Nazi Germany. 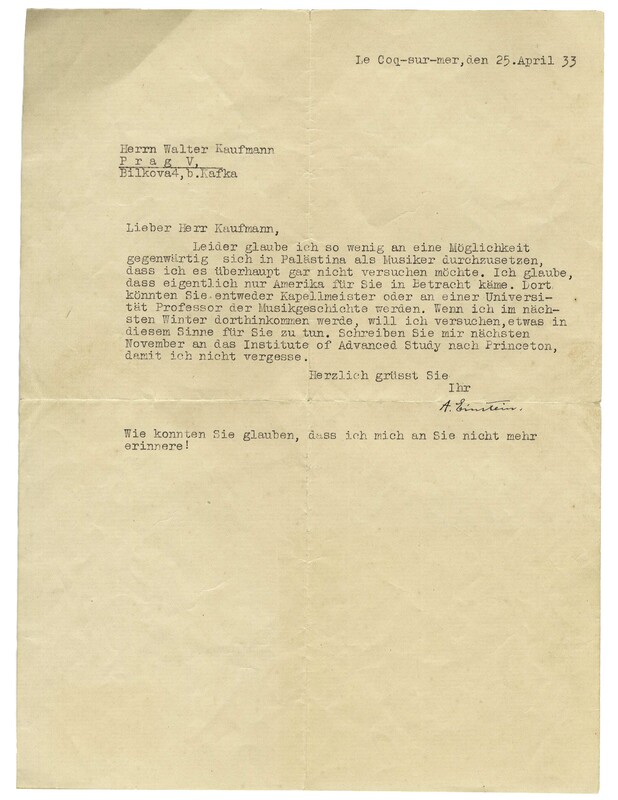 Einstein writes on 25 April 1933 to the Jewish composer Walter Kaufmann, who is likewise deciding where to live, upon discovering that one of his Ph.D. teachers in Prague led the Nazi youth group. 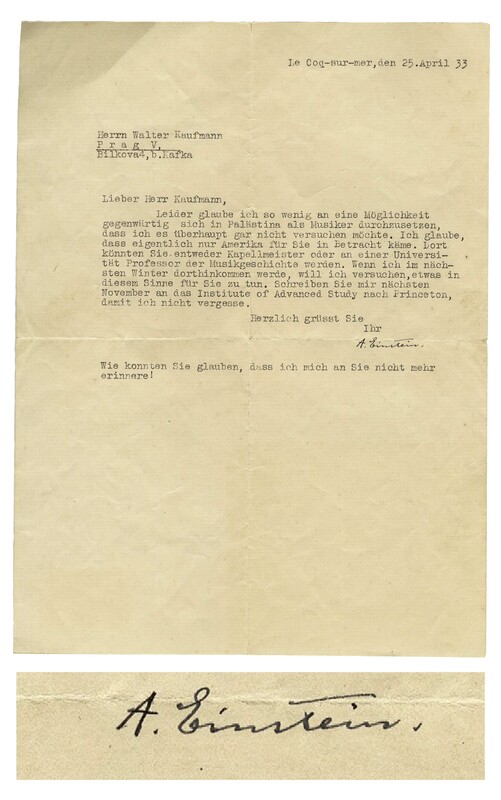 Letter in German translates, ''Dear Mr. Kaufmann, Unfortunately, I have so little faith in the possibility of prevailing as a musician in Palestine at this time that I would not even want to try. I believe that, ultimately, only America would be a likely choice for you. You could become a conductor there, or a professor of musical history at a university. Next winter, when I am moving there myself, I shall try to somehow help you along these lines. 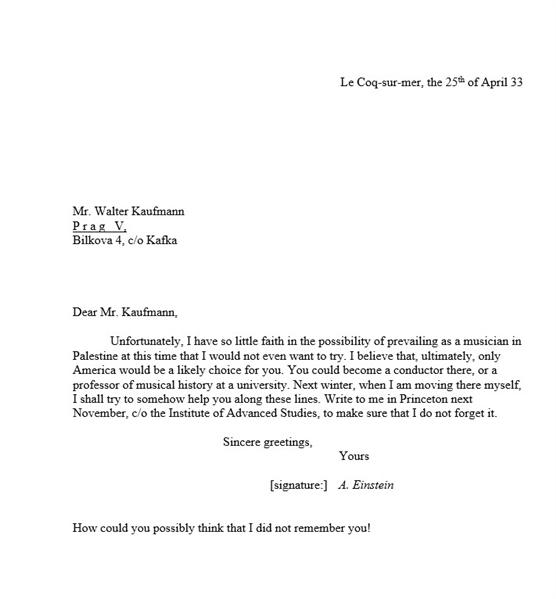 Write to me in Princeton next November, c/o the Institute of Advanced Studies, to make sure that I do not forget it...[signed] A. Einstein / How could you possibly think that I did not remember you!''. Kaufmann would settle in India in 1934, ultimately moving to the United States in 1957. Einstein, of course, moved to the United States in 1934 as a refugee. Letter measures 8'' x 10.75''. Minute separation at ends of folds, and light creasing, otherwise near fine. Accompanied by full translation.